Boasting three downhill skiing and snowboarding resorts and an additional resort for cross-country skiing and snowshoeing, Big Bear is a premier Southern California winter vacation destination. The Big Bear area offers everything winter sports enthusiasts need for an enjoyable visit, including award-winning slopes, convenient amenities, and professional instruction. Nestled in California's ruggedly beautiful San Bernardino Mountains and surrounded by the San Bernardino National Forest, Big Bear is located 100 miles northeast of Los Angeles and is an approximately two-hour drive from most major Southern California cities. Winter recreation seekers can access Big Bear by car via Highway 330/18 from San Bernardino through Running Springs, Highway 38 from Redlands, or Highway 18 from the Lucerne Valley. Travelers can also fly in to the region. Several airlines offer commercial flights to the Palm Springs International Airport, which is located about 36 miles away, and small, private aircraft can fly in to the Big Bear Airport in Big Bear City. 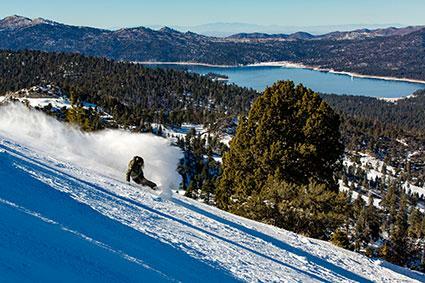 A company called Big Bear Mountain Resorts operates two of the largest and most popular resorts in the area, Snow Summit and Bear Mountain, each of which provide distinct snow sport experiences. Snow Summit caters primarily to families and traditional skiers and snowboarders, while Bear Mountain appeals to snowboarders and avid skiers who crave its great vertical terrain. The sister resorts offer interchangeable lift tickets that allow visitors to take advantage of the two resorts for one price and are also connected by a free ground shuttle. Snow Summit and Bear Mountain both receive an average of 100 inches of annual snowfall and utilize state-of-the-art snowmaking equipment. Lifts: Snow Summit has 14 ski lifts, including two high-speed quad chairs, two regular quad chairs, two triple chairs, five double chairs, and three moving carpets. Instruction: Snow Summit's Ski and Snowboard School offers private and group lessons for skiers and snowboarders of all ages. On-Site Dining: Located at the top of the mountain, Snow Summit's View Haus restaurant serves up an array of burgers, barbecue, and deli sandwiches. Lifts: Bear Mountain has a total of 12 lifts, which include two high-speed quad chairs, one regular quad chair, two triple chairs, four double chairs, and three moving carpets. Terrain Difficulty: Skiers and snowboarders of all abilities can enjoy Bear Mountain; 15 percent of the resort's terrain is designed for first-time beginners, 15 percent for low intermediates, 40 percent for intermediate, and 30 percent are suitable for advanced skiers and snowboarders. Beginner Areas: Designed for novice skiers and snowboarders, Bear Mountain's Skill Builder Parks allow beginners to hone their skills before attempting to tackle the resort's more-challenging terrain. Instruction: Bear Mountain offers private and group ski or snowboarding lessons for all ages and abilities. On-Site Dining: Resort visitors can choose from seven on-site bars, coffee shops, and restaurants, including West End Java, Rail View BBQ, Silver Mountain Eatery, Geronimo's Outpost, the Board Room Bar, the World-Famous Beach Bar, and the Aloha Grill. Equipment Rentals: Bear Mountain offers equipment rentals, lift tickets, rental helmets and snow pants, and other essentials. 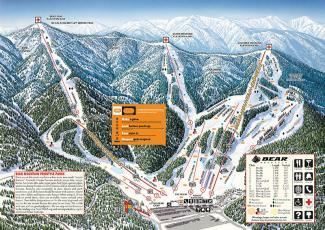 In addition to Big Bear Mountain Resorts, skiers and winter sports enthusiasts will enjoy the following locations. 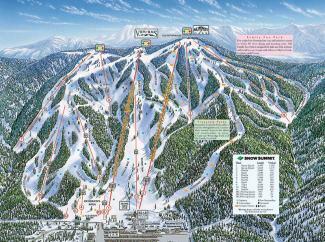 Lifts: Snow Valley has 12 ski lifts, which include six double chairs, five triple chairs, and one moving carpet. Terrain Parks: Snow Valley features multiple terrain parks, including Schighridj (pronounced Sky Ridge) with more than one mile of vertical highs and lows, and The Edge which features rails, tabletops, funboxes, banks, spines, and more. Instruction: Snow Valley's Children's Learning Center offers traditional skiing and snowboarding lessons for children ages 4 to 12, and the resort's Learning Center provides private or group ski and snowboard instruction for guests ages 13 and older. On-Site Dining: The resort offers five dining options, including the Chalet Restaurant, the Patio BBQ, Deer Meadow Grille, WR's Smokehouse, and the Last Run Lounge. Equipment Rentals: Resort guests can buy or rent ski and snowboard equipment from Snow Valley's on-site Sport Shop. Instruction: Rim Nordic offers cross-country skiing lessons, which were touted by some Yelp reviewers for the friendliness of the staff and the affordability of the instruction. On-Site Shopping/Dining: Rim Nordic has a small retail shop where guests can purchase or rent equipment, or pick up a snack to refuel and recharge. 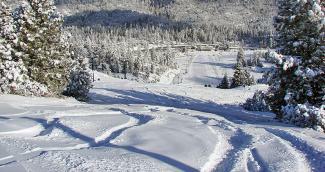 Snow play, sledding, and inner tubing are also popular winter activities in the Big Bear area, which features two snow play parks. 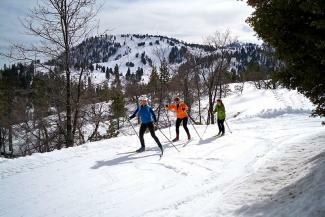 Big Bear Snow Play features Southern California's longest runs. Alpine Slide at Magic Mountain offers an authentic bobsledding experience. Both snow parks utilize resort-quality snowmaking equipment and have Magic Carpet uphill lifts to make navigating the park easier. The Big Bear area, which includes the communities of Big Bear Lake, Big Bear City, Angelus Oaks, and Running Springs, offers a wide variety of lodging, shopping, and dining options. Lodging: Big Bear's lodging options run the gamut from full-service chain hotels to bed and breakfasts, resort cabins, luxury rentals and everything in between. Travelers can also take advantage of additional lodging choices, such as area RV parks and hostels. Shopping/Dining: In addition to area resorts' on-site shopping and dining options, visits can also find a large selection of shops and restaurants in the towns that make up the Big Bear area. With so many resorts offering such a full range of amenities, Big Bear area visitors are spoiled for choice. Whatever travelers decide, a visit to Big Bear is sure to provide a memorable, fun-filled experience.